Tags: Announce, cartoon, Feature Film, Hanna-Barbera, Theatrical, Warner Bros.
Funnyman Will Ferrell and partner Adam McKay are working on bringing back everyone’s favorite stone-age family. The duo’s production company Gary Sanchez Productions is in development on a new Flintstones animated feature. Warner Bros. previously tried a Flintstones TV series produced by Seth MacFarlane, but that project never got beyond the pilot stage. The Flintstones– Fred Flintstone and his wife Wilma, neighbors Barney and Betty Rubble- first appeared in Hanna-Barbera’s 1960 animated series. The prime-time animated show was a take off on The Honeymooners set in prehistoric times. It proved a cross-over hit that appealed to children and parents alike. Gary Sanchez Productions partner Chris Henchy will write the movie, with Ferrell and McKay Executive Producing. 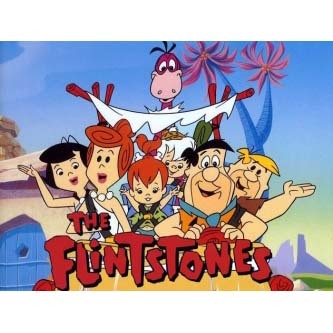 The Flintstones last appeared in a series of live-action films from Universal. The 1994 live-action version featured John Goodman, Elizabeth Perkins, Rick Moranis and Rosie O’Donnell, and grossed an impressive $341 million. Warner Bros. recently announced a slate of three animated films for 2017-2018. The May 26, 2017 released was announce to be The Lego Movie 2, sequel to this years big hit The Lego Movie. The February 10, 2017 release was assumed to be Storks, the project written by Nicholas Stoller and headed by Doug Sweetland, and the February 08, 2018 was thought to be Smallfoot, helmed by Sergio Pablos. Both features had previously been announced with no set release date. It is not currently known if The Flintstones will be added to the previously announced schedule, or added to it. We assume the slate Warner announced is for existing projects, not projects just starting development like The Flintstones.